But rents tank in the most expensive metros. Even Seattle cools off, awash in new supply. In New York City, the second most expensive major rental market in the US, the median asking rent for one-bedroom apartments fell 3.7% from a year ago to $2,870. For two-bedrooms, it fell 5.0% to $3,230. Since the peak in March 2016, asking rents have plunged respectively 14.8% and 18.8%. A modicum of relief for renters, a headache for landlords, a sign that new supply from the construction boom is having an effect, and proof that even in New York, you can inflate rents only so far. 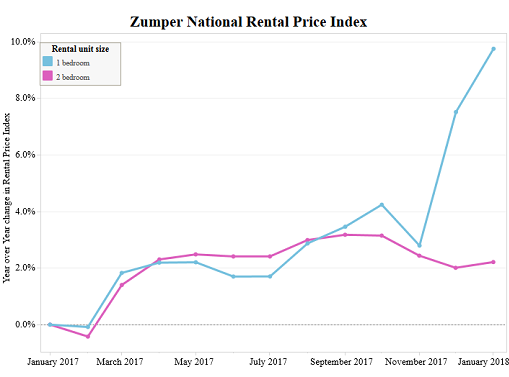 The data is based on asking rents in multifamily apartment buildings, gleaned from “over one million active listings” that Zumper aggregated in its National Rent Report. Not included in the data are single-family houses and condos on the rental market. Also not included are incentives, such as “1 month free” or “2 months free,” which reduce the effective rent for the first year by 8% or 17%. The data includes asking rents from new construction. In many cities, high-rise apartment and condo buildings have sprouted like mushrooms. These units are now showing up in large numbers on the rental market, and landlords need to fill them – hence more pressure on rents. In San Francisco, the most expensive major rental market in the US, the median asking rent in November for one-bedroom apartments, at $3,400, inched up 1.5% year-over-year, but is down 7.4% from the peak in October 2015. The median asking rent for two-bedroom apartments, at $4,380, fell 2.9% year-over-year, and is down 12.4% from the peak. In Honolulu, the 11th most expensive rental market in the US, one-bedroom rents, while flat year-over-year, have plunged 20.2% from their peak in March 2015. Two-bedrooms fell 7.1% year-over-year and are down 24.7% from their peak in January 2015. In Chicago, the 12th most expensive rental market — down from 8th place a year ago — the median asking rent for a one-bedroom dropped 15.6% year-over-year to $1,570, and for a two-bedroom 13.1% to $2,180. They’ve fallen by 23.4% and 17.7% from their peaks in September 2015. In Oakland, whose rental market had been inflated by San Francisco’s housing refugees, median rents took serious hits recently but in December ticked up year-over-year. From their peak in April 2016, one-bedrooms are down 10.7% and two bedrooms are down 11.6%. It was a mixed bag for the other metros of the 12 most expensive. 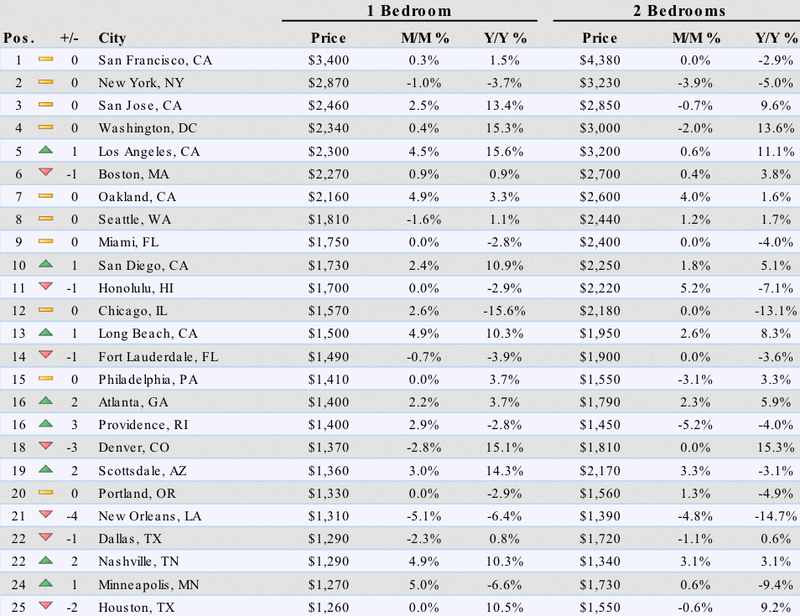 One-bedroom rents set new highs in San Jose, Washington DC, Los Angeles, and San Diego. But two-bedroom rents set a new high only in Los Angeles. A special word about Seattle. The median asking rent for one-bedrooms in Seattle is now down 7.2% from the peak in August last year and the median two-bedroom is down 7.9% from the peak in April 2016. It seems the declines, though still small compared to the surges of the past, are more than just a seasonal blip. Seattle’s economy is strong, but in 2017, its epic construction boom completed nearly 12,000 new units, counting only buildings of 50 or more apartments. This does not even include condos that have been acquired by investors and have reappeared on the rental market. This supply of new units continues and will apply more pressure on rents. But rents jump in many mid-tier metros. And suddenly, a new phenomenon appears. One bedroom rents are rising far faster than two-bedroom rents on a year-over-year basis, and in cities where rents are falling, they’re falling more slowly for one-bedrooms than for two-bedrooms. And not just a little bit. This is the case in 9 of the 12 most expensive metros in the table above. For example, in San Francisco, one-bedrooms rose 1.5% year-over-year and two-bedrooms fell 2.9%. In New York, one-bedrooms fell 3.7% and two-bedrooms fell 5.0%. 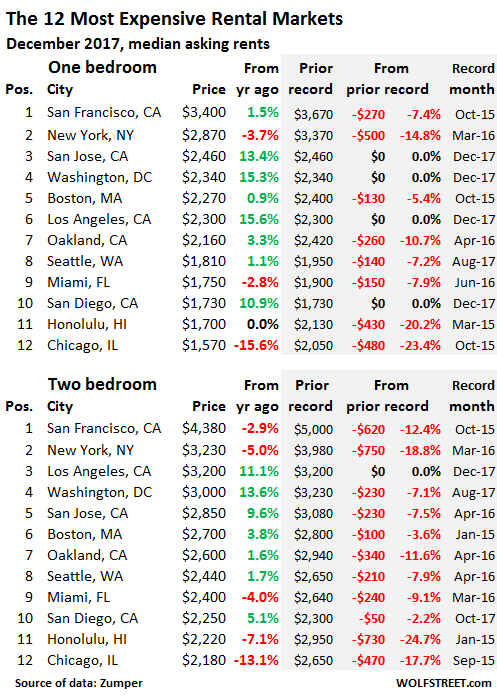 In San Jose, one-bedrooms jumped 13.4% and two bedrooms rose 9.6%. And so on. And it’s the case further down the list. For example, in Scottsdale AZ, the 19th most expensive rental market, one-bedrooms surged 14.3% while two-bedrooms declined 3.3%. Or Portland, next in line, one-bedrooms declined 2.9% while two-bedroom rents declined 4.9%. Or New Orleans, next in line, one-bedrooms fell 6.4% and two-bedrooms plunged 14.7%. Or fell more slowly than two-bedroom rents fell. This means that the one-bedroom rental market on average is far hotter or at least “less cold” – depending on the metro – than the two-bedroom market. This phenomenon started in November and expanded in December. This divergence between one-bedroom and two-bedroom asking rents is not hurricane-related but is spread across the country. It is also peculiar that the divergence materialized all of a sudden in November and didn’t revert in December but instead widened further. 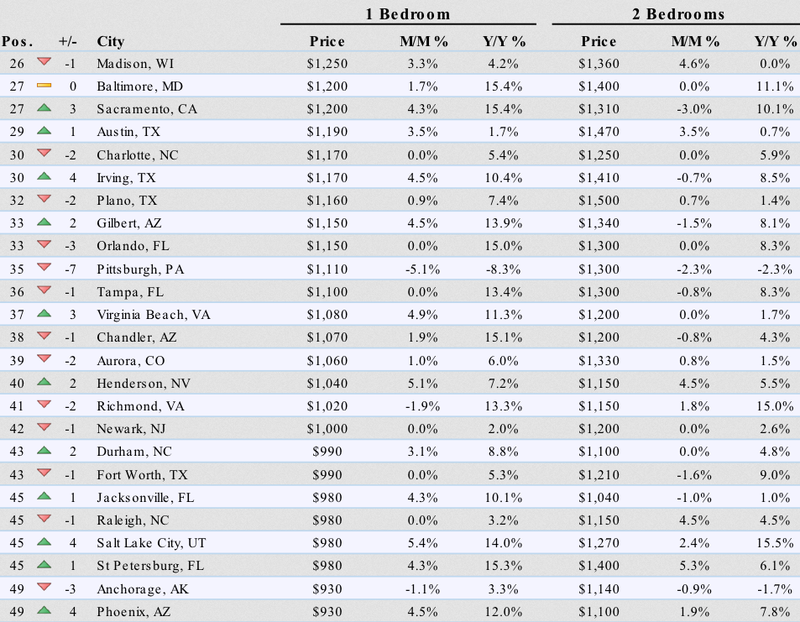 Below is Zumper’s list of the top 100 most expensive rental markets. Check out your city (click to enlarge). I suspect that demand for one bedroom units is going up because people are downsizing from pricier two bedroom units. If you can’t afford two, get a one. I also know of people in two bedroom units quietly renting the second bedroom to needy friends. Landlords get upset, but it is hard to stop. The tenant tells the Landlord that he has some or relatives friends “visiting. That’s the advantage of having two bedrooms. Subletting one helps pay the rent. It is what I have to do in Sydney. So in Mosman, one of Sydney’s best harbourside suburbs, I am effectively paying only $A900 a month, a 20 minute ferry ride from the city centre, and with a covered garage. No complaints from the agent so no need to fib. I don’t understand how rents could go up when a lot of people have left the area. Employees with H1B sponsorship left the area since the government agencies don’t hire them. Now the Trump administration is reducing the number of employees so therefore, I would think even more people are leaving the area. I also heard that there are plans to build even more apartment buildings! Check out the article below from Washington Post that mentions at least 16,000 jobs were affected? frequently don’t own their properties free and clear; they have mortgages to service. Those landlords live or die on cash flow. If they have a lot of vacancies, they will try to make up the shortfall any way they can and that includes jacking up rents for the units that are occupied. Now you may say that that is self-defeating and I would agree, but they may not see any alternative. They have to be careful not to go too far and exceed the cost of moving. With the so-called”financialization” of this country we’ve created a rat race, and the rats are winning. I have read and “heard” that that vacancies don’t really matter, rents are so high, buildings are profitable with what would be considered massive vacancies in normal times…many are left off the market to create “demand”…….it’s another bubble. Not really. Explain why there is a huge supply of very expensive vacant commercial storefronts in San Francisco’s east side. SOMA, Mission Bay, the Mission, and the full length of Market Street are drowning in vacant storefronts. Landlords keep raising their rents, chasing out longtime tenants, and then sit on the empty properties. Some of these properties have been vacant for several years now, with little or no movement on price. If vacancies mattered, these LLs would lower rent until the market cleared. There are several very important reasons why it’s often in the LL’s interest to keep a property vacant instead of lowering rent until someone bites. As a landlord, it’s obvious you don’t know what you are talking about. If rents have peaked and the market is softening due to being overbuilt , two bedroom units would be more desireab than a one bed. Reduce expenses as a tenant by sharing a 2 bed. In a softening market like seattle, you don’t just jack up rent on a 1 bed hoping to make up the loss on a two bedroom. In fact, if the market softens you may offer “free rent” or even offer a reduced rent to an existing tenant in order to keep the tenant. The laws of supply and demand will always dictate the market. Every hot market will get overbuilt and rents will adjust downward. I didn’t know the agencies were hiring these employees. Interesting…. I didn’t think you could legally do this….. I think it’s the state govts hiring them. I heard the state of FL hired many, mostly Indians, in Tallahassee. The state salaries are very low in FL. I know of a woman lawyer who works for the state and makes in the $40Ks, she is only working for the medical benefits for her family. US civil servants have to be “US persons” (citizens or green card holders). H1-b holders and other visa holders are not eligible to be employed by the US government. However, some government contractors could employ visa holders, but not if they require security clearances. I work at Johnson&Johnson in Massachusetts. In my group, there about are about 5 people working as direct hires for J&J vs the rest of us who work for Kelly Temp services – about 15 of us. Kelly has an on site office. Most are full time hires at Kelly. So…can’t underestimate the possibility of huge numbers of temps working at “civil service” jobs. The question wasn’t “temps” but H1-b visa holders (foreigners on work visas). Sorry my mistake. I should have mentioned we have lots of Indians working here. My guess is they are H1-b workers. The Miami condo bust is in full force, sort of. The last hurricane created a lot of damage to condo buildings and everybody wants out. I read, in their newspaper, the assessments on the owners are painful. One owner quoted said he reduced his price one third and his condo assessment for damage was $60K. With all the northerners heading for the exits it may not matter. Do you guys remember a time when they promised we could work from home using a computer and an Internet connection? Those times are ending. Hence the need to live somewhat close to work as if we lived two centuries ago. raxadian – Especially since owning a car is expensive, and it’s expensive to commute in the thing in terms of time as well as money. This is why auto sales are in the pits. It often works out cheaper to live close to work and just walk, bike, or take the bus. The promise of letting employees work from home is a story I’ve been hearing from the days of the now dead and gone Sun Microsystems claiming they’re the dot in dotcom. They never had enough space for all their employees, which was one reason they invented the network computer. Their employees could use the ROLM phones and own an office desk for the duration they were docked in there. That was Bay Area then. I have worked with companies since and their work from home policy is a good indicator of their work culture, IMO. Usually when a company requires software engineers to be on site, it means work is not their most important reason for existence as a group. They measure their employees as resources and have mangers upon managers shepherding the people doing actual work. Having people on site allows them to micromanage, build empires, and gossip. And they’ll have scrum meetings on the hour to make sure developers are not taking long bathroom breaks. I don’t know much about Agile but I observe it requires meetings and hanging about in groups, both of which cannot be done well over the phone. In this cycle, I think the fault is to be laid at the feet of Marissa Meyer. She discovered that employees were working on their pet projects when not in office. After all, which company has had ideas that let go its future existence? Never mind the 3Ms and Googles of aughts (their gmail idea is now their big source of data mining and selling us to politicians). So she stipulated that everybody work from office. She even got the stenographers in the press to claim how all best work is done by group meetings. Suddenly, all these micromanaging managers jumped out of the woodwork and used her as an example to summon people back to work. And that was how the work from home died this time. Funny how internet companies that enable distant communication don’t think much of it when it comes to themselves. In other interesting news, another of Meyer’s other gems was the idea to kick away people who were not using their yahoo accounts frequently. They cleared the deck to service all those dying to get email ids on yahoo. I am sure the people who were kicked out must be thanking their stars after the 2014 hack when every single id was stolen. In the end those accounts remained unclaimed and their user base shrank. Regarding Agile, which I really did not like. It was ten years ago, I was at a Fortune 500 company, nationally distributed, and some people were in India. Agile was high-stress for me ( with no similar processes in my history, I was a standard waterfall methodology developer for decades ) and it increased my output quite a bit. All of our meetings and daily scrums were “ONLINE REQUIRED” , using some very good meeting software/hardware. I was in the corporate HQ, but we were required to use the online meeting process instead of going to a nearby and available central Corporate meeting facility. All online all the time and it worked very well. And I did not like the online aspect of it either, dusty dinosaur that I am. WFH seems to be effective in relatively low-skill industries where results are easily quantifiable and not particularly dependent upon face to face interaction. There was that famous study from Shanghai (IIRC) and a call centre where WFH people were far happier, more productive, etc. Well yes, a call centre. Problem is – and I’ve very close family/friends in “higher” end disciplines who report this – the WFH dynamic is abused by roughly 3/4ths of the people who effectively become less productive. The remaining quarter will still be productive if you make them schlepp themselves downtown each day and you will get more out of the 3/4th who are effectively the slugs if you have an eye on them as their manager. Not to defend the appalling Marrissa Mayer in any sense, but I do actually think she was on to the more or less correct idea here. If unintentionally so. Oh man, Golden Marissa Meyers, how is she doing these days… haven’t kept track. She was what… the CEO of Yahoo? Heard that’s a real success nowadays. I mean, it is under another Googler right? Timmy Armstrong, I think he was running this other famous company called AOL, I remember that one, a real giant. Yep, very impressive, those two, managing to resurrect those old stalwarts from the grave to become once again firsts among equals. They are just the best. I work from home, have for the better part of a couple years now, and I only go in a couple times a quarter to pick up/drop off paperwork. I write software and my output is high, I dont need supervision I just need idiots to get out of my way. What is said about the need for a fiefdom is true, much is about “power” and that is measured in square footage and belly buttons by the idiots up the management chain – to the point of retaining empty office space while laying off good workers, I kid you not! Scum management in so many of these big companies deserve a firing squad. that is still insane at $34,440/yr……The median household income across New York City stands at $50,711 ….!!! WTF is going on? The math does not equate!!!! Welcome to the brave new world of central bank liquidity! If rents fall too far, they will likely need to hit control “p” again. NYC has rent control left over from WWII and rent stabilization left over from the 70’s. The city uses tax abatements and other incentives to subsidize housing. The working class in the city is usually corralled into the neighborhoods and buildings with the incentives. Market rents are only paid by very transient residents because everybody with money buys a condo or coop. People are stretched to the limit. They are cutting back everywhere including the rent. I know caused we did it too, moved out of state and to a smaller house. BTW, since the financial crisis every move has been to a smaller place. We bailed out of a New Orleans vacation last summer due to all the crime. The shootings and carjackings are a daily headline there. I’m not surprised the rents are falling, it’s like Chicago. I read their priciest restaurant closed yesterday, not a surprise considering the crime. People are not stretched to the limit. If this is the case,, you’d see bad numbers for holiday spendings and general consumer spending.. which is not the case yet. I’m not disputing that Xmas was very good for retailers. I spent more because we had to replace some items. But in general everything we bought was something we needed, not just something we wanted. I’d put it this way: Some people (a lot them, actually, including those paying 60% or more of their after-tax household income for housing) are stretched to their limits. Many others are doing very well. And others that are stretched still get credit and can buy stuff with borrowed money. This article is very sobering and prompted me to do a little online research on wage rates and rents. $3400/month rent for an apartment is just over $100 per day after taxes and other deductions (of net income). If you plan on a regular work schedule of 22 days per month…8 hours per day, that is actually $155/per day of your after tax dollars to pay for a rental apartment shelter. The median wage for an electrician in SF is $34.00/hour, or approx. $270 per day. let’s imagine the electrician clears $220/day (which he/she won’t) that leaves the tradesman 4800 left to survive on for the rest of the month. After rent, that would be $1400 for the remainder of possible expenses he/she might incur. Clothes, food, transportation, payments…whatever the list might contain, it cannot maintain even a rental lifestyle. In Boise Idaho the same Tradesman will make an average of $28.00 per hour. For comparison purposes that same employee will take home approx $4,000/month. Rent, as of November 2017 was averaged to be $980/month, leaving the same tradesman $3,000 per month to pay for all other bills. Sooner or later people will have to simply leave these places. Idaho is a nice state. Average teacher salary in California is under $60,000. “Average Mechanical Engineer Yearly Salary in Idaho. Mechanical Engineers earn a median salary of $76,850 per year. Salaries typically start from $47,140 and go up to $121,180. No brainer, save enough for a Uhaul and say, “bye bye”. Just to hit a 28% of gross income rent at $3k you need to make over $120k. A single person in this case is probably better off owning for the added tax breaks. The majority of workers at least the bottom 75% are never able to comfortably afford a $3k place. New tax law basically eliminates the advantages of owning versus renting due to the new higher standard deduction which means one does not get the benefit of mortgage interest as an itemized deduction until you pass a certain amount of interest paid. It will take a while for this to sink in since we have all be trained for decades to think otherwise. People are moving to Boise in droves from pricier cities, just for this reason – and in doing so they are driving up prices here. LoL- the average rents are too damn high, because the average wages are too damned low. The cure for high rents is a lot of new buildings, which will eventually lead to low, reasonable rents and empty buildings. And lower real estate prices, lol. Now, reality bites, and hot cities eventually price our their advantages. It also becomes a vacuum for older people, because they leave as rapidly as possible when the value of their property becomes great enough to finance a comfortable retirement in flyover. Reading the rents is simply reading land constraint demand. The first big tech folks already were planting back office blocks in suburban Arizona for this very reason- I don’t need accounts payable, basic accounting support functions, and other office deadwood to be priced at Sillycon valley costs. But other companies are starting to move big nodes to Scottsdale or Iowa to find cheaper office and employee costs. 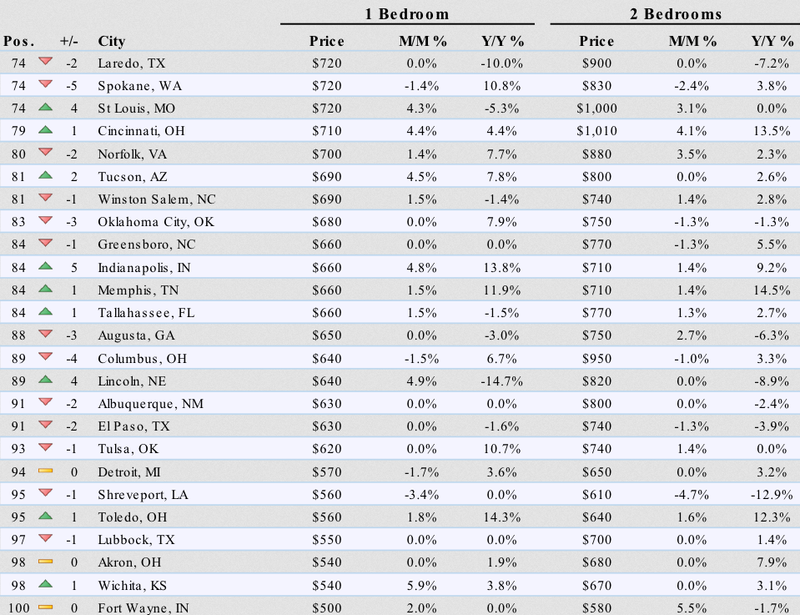 Now, reality is a tremendous amount of smaller cities in America are very underpriced in comparison to the hottest rental markets, and efficient capitalists would be moving operations. After all, if a significant amount of my worker compensation premium is going to land owners, I should be getting more of my nonpremium employees away from the cost premia. 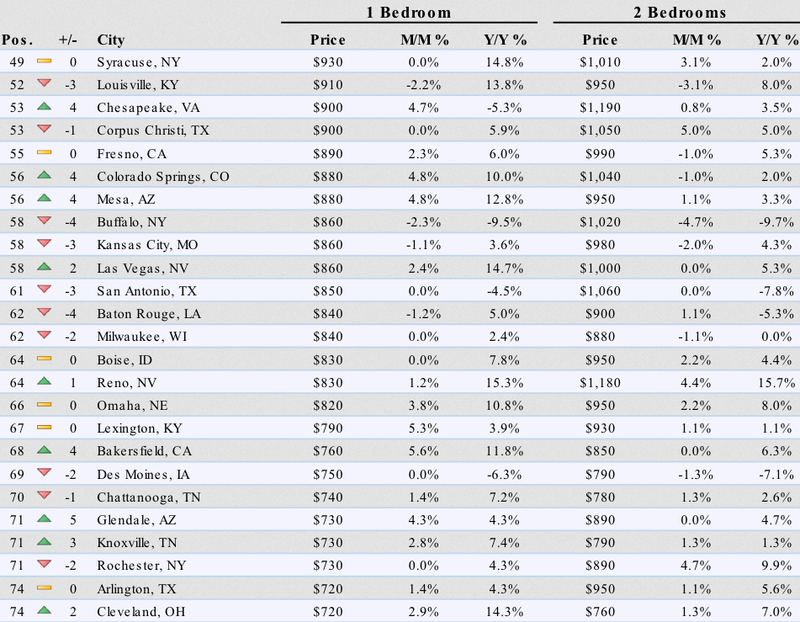 In short, Ft. Lee New Jersey beats Manhattan….and Hacketstown is even cheaper…but Scranton is the cheapest. The Execs stay in Manhattan, and the Prolz get sent to Scranton. It’s a mixed bag probably due to down-sizing and relocating. I read yesterday that Illinois is the number one state in out migration. And two or more people can share a one bedroom apt. The largest US metropolises, as with many global cities, are fully globalized. They thrive in a reality apart from the ‘median’. Good point, but this has been going on quite a while. I have a friend who manages a mid-sized apt complex in the midwest. He told me the one bedroom market was hot and had difficulty renting the two bedrooms two years ago. I think that as others have mentioned, people are downsizing to save on rent. It’s easier to get two people to share a one bedroom than four to pay for a two bedroom. Kids in their twenties often shack up, college dorm style, two to a room to save on rent. Most landlords that manage larger complexes don’t even try to enforce rules on how many people live in an apt. @Lux2 , I would argue the opposite. As a millennial, I’m observing my peers progressing in their careers and starting to want their own apartment instead of having roommates. Or couples moving in together and wanting to share an apartment. That doesn’t explain the sudden divergence though, unless it correlates with the mass of engagements that happen right before the holidays. Miami prices should continue to fall…ton of construction and cranes across the skyline with a ton of supply already on the market. Miami Beach also…rental signs everywhere!!! These things take time and you have to be patient. Rome didn’t fall in a day – it took a few centuries, more than twice as long as the US has even existed. This is not to say you shouldn’t invest in Florida real estate, but you need to guess correctly how far inland people will need to go (Atlanta maybe), and of course there’s the timing. It’s later when you think. @walter map. I think much relies on Canada. If there’s a crash in Canada, it’s bye bye South Florida. Many Canadians own houses there. Very true, Rates. And it’s not just the Canadians. Interestingly, significant sources of risk like this one are not always obvious: one might not normally expect the health of the Canadian economy to be a factor in Miami real estate. Still, one wants to keep a look out for dangers arriving suddenly from unexpected quarters. I’m persuaded that risks are far too unappreciated these days, and there’s a lot of them. The usual indicators of financial/economic risk don’t seem to be working at present as a result of flattening due to Fed policies. That could give investors a false sense of security and contribute to present asset overvaluations. Perhaps our illustrious host could do an analysis of that and give it a more proper treatment than I could do in a comment. Asking rents have plunged, because the askers need the cash. a) keeping the banks & money lenders at bay. b) gearing up to beg new loans, extensions of existing loans & the renegotiation of existing loans. Today’s renting habits are – Room To Let – shared accommodation – shared bedrooms – bed & shower for the night to rent, breakfast is at mcDonalds & the like. This is called freedom / living free, by some. Where I live shows up as #100 on the last chart and even with the lowest rents in the nation a slew of new rental units are coming online. Fort Wayne, Ind. recently announced another incestuous boondoggle to be built using government money in an area where few people want to live. Ironically I found out about this project on the very day that I had just read an article about the 10 most and least expensive cities in America to rent an apartment and Fort Wayne was one of them. The article below contains the hard to believe details.